In another stroke of pure Bush-league genius, seven years of hard work by our best and brightest aerospace engineers were flushed down the toilet this week as Washington once again failed to complete even ONE task that somehow helped to improve our country. "It may be the final postscript in the KC-X tanker competition... but it's not a satisfying ending. On Wednesday, the Department of Defense notified the Congress and the two competing contractors, Boeing and Northrop Grumman, that it is terminating the current competition for a US Air Force airborne tanker replacement." "Over the past seven years the process has become enormously complex and emotional -- in no small part because of mistakes and missteps along the way by the Department of Defense," said Gates in testimony before the House Armed Services Committee. "It is my judgment that in the time remaining to us, we can no longer complete a competition that would be viewed as fair and objective in this highly charged environment." You'll remember that the KC-X tanker – a $40 billion dollar contract – was awarded to a team comprised of Northrop Grumman and EADS on February 29, 2008. 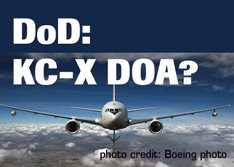 But after the Government Accountability Office (GAO) made the decision to uphold a protest from Boeing, the Pentagon stepped in to referee the resulting mess. As late as last month, The Pentagon and DoD were still moving forward on KC-X, releasing several clarifications to the original KC-X RFP. That was before the hammer came down and the whole project was back-burnered to create one more BushCo mess the next administration will have to clean up. "In its own statement, Northrop said the Pentagon's decision only serves to further put off the needed replacement of the Air Force's aging fleet of KC-135 Stratotankers. "With this delay, it is conceivable that our warfighters will be forced to fly tankers as old as 80 years of age," Northrop spokesman Randy Belote said." 80 years...Huh? 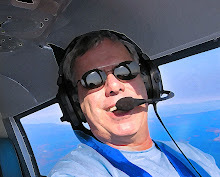 So NG is saying that in 2037, we will still be flying KC 135s? That is 29 years away, and while we know that at this moment in time, our government seems to be unable to develop a replacement for the Stratotanker, I have to believe that somehow, they'll get their heads together in 29 YEARS to come up with a NexGen flying fuel farm. ANN's Realtime reporting again hits one out of the park on this story. 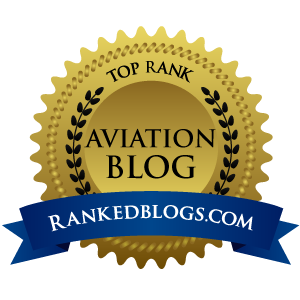 If you do not have their site bookmarked and are not checking it multiple times a day, you are not riding the cutting edge of aviation news. As a writer, I love their style of reporting, it is raw, timely and complete. As to the Lame Ducks running our country today, this ugly news is just more of the same smoke, mirrors, rhetoric and shell games that has been the Bush trainwreck these past eight years. That's not government we can believe in, said Senator McSame, I presume.